But let me start at the beginning. How did we get there? Ellis started school this year. So did Milo. It’s been a germ factory in our home ever since. We’ve been sick-all 7 of us, off and on for the last six months. It’s been pretty brutal. For the most part, every time one of the kids were sick they bounced right back, except for this time. Ellis started getting congested over the weekend, but it was nothing major. By Monday morning she felt crummy enough that I kept her home from school, with our sitter and off to work my husband and I went. A few hours into the day I get a call from our sitter saying it seemed as if Ellis was having trouble breathing. An appointment was made with our pediatrician. I finished my work and planned to meet them there. Only as soon as they got to the Doctors office things with Ellis started to rapidly deteriorate. I received a call that they were transferring Ellis to the Oklahoma City Children’s Hospital via ambulance lights and sirens. No. This couldn’t be. My heart was reeling. Mostly because I was so confused at how we got from Point A to seemingly Point G. Everything had happened so fast. And Children’s? I have so much trauma from our first event there when Ellis nearly died. So much so that I was terrified to return. My husband DeAngelo met me in the ER waiting room. My legs were shaking so badly I could barely walk. I clutched onto him as we walked back to where Ellis was...in the EXACT same ER room we were the first time. Of all the places she could’ve been. She was struggling for breath and looked terrible. They put her on max oxygen and nothing was keeping her stable. I was terrified at the thought of having to possibly see her on a ventilator-once again. They ran tests and more tests to see what was wrong. At one point the Doctor came in and told me they were still waiting on more labs to come in. It’s crazy I even felt the need to clarify my fear of “bad stuff”. But with our history my mind races to the bad stuff immediately. I put out the word on social media and was, once again, reminded of how amazing it can be in situations like this. I knew my community would be on the case as soon as you knew. And you were. Your thoughts and prayers were comforting to us in more ways than I could ever put into words. You carried us. We never felt alone. Thank you. Test results finally came back: Ellis had RINO virus, Pneumonia and a collapsed lung. It seems almost crazy to me, I was grateful that was all it was. But when you almost lose a child to a deadly disease like meningitis, everything else seems pretty mild in comparison. Still, it was a scary situation and it took several hours to get her stable enough to head back to the PICU. I was on edge and constantly worried things would suddenly take a turn for the worse. We ended up at the hospital for nine days total. Four of those spent in the PICU. Ellis had many ups and downs while there and I was an emotional basket case nearly the entire time. I can’t really even begin to explain how difficult of an experience it was to go back to the scene of the worst moment of our lives. We ended up in many of the same rooms as the first time. Had many of the same doctors. Some of the same nurses. The smells, the sights, the sounds were so familiar-and so triggering. My husband had to remind me over, and over, and over again-Sarah, this is not the first time, this is different. The entire time I was very much so internalizing the events and mulling them over in my head. I said on one of my social media posts, I have “lots of thoughts”. So here they are below. I was reminded of how many gut-wrenching life decisions parents are forced to make for their children in the PICU. The first night we met a family doing just that. My heart was broken as I heard their story and saw myself in their pain. As I laid on my cot, trying to get a few hours of sleep every night, I would think about being in their spot. Many nights I couldn’t sleep because my heart ached for them...for all these families. So I would lay there and pray. There was nothing more I could do. I was beyond thankful that even though we were in a serious spot, this time, we were not talking death. There’s nothing worse. I was also reminded of how powerful Ellis’ story was and still is. We met so many medical staff who remembered her. They all told us they could never forget. And each time they would walk in, shaking their heads at just the site of her. For those staff new to her story-there were a lot of questions. I would calmly recall the events point by point. Every time their eyes were wide as they affirmed it surely was a complete miracle she’s still with us. It’s not always easy, recounting the events of her short 3 years, but I feel like the more I share, the more it gives purpose and meaning to what we’ve walked thru. And if there was any doubt, of the power her little life displays, that was put to rest with every encounter we had. I was reminded to always return to His faithfulness. It’s been a long journey with Ellis. And we’re still in the thick of it with Doctors, therapies, equipment and the like. But when we returned to the hospital, it reminded me of how far she’s come. And it’s very far friends. VERY far. It’s easy to get frustrated we’re not where we want to be. But this hospital stay made me realize we’re also not where we were. There’s a line from a song that’s held me steady “I’ve seen you move, you moved the mountains. And I believe, I’ll see you do it again.” So that’s what I believe for her life. We’ve seen the mountains move before and I’m just going to keep believing we will see them fall, yet again. And fall they do. Sure, we encountered Doctors who still doubt her. If you follow me on social media you’ll know there was a big bru-ha-ha about if this pneumonia was caused by her inability to swallow properly. I knew she could swallow perfectly-but people see her and always doubt. As her Mom, that enrages me. But as her Mom, it’s also my duty to support Ellis and let her prove the skeptics wrong. And that she did...by passing her swallow test in mere minutes. She’s like me, in that she does things in her own time and her own way. She’s also like me in her stubbornness. It serves her well. She’s a fighter. They can doubt her, but I’ve learned better than to do it myself. As for this little fighter-well....I see a future where she just keeps proving ‘em wrong over and over again. Lastly, I realized with certainty, it was not by my own strength I did it the first time. In fact, I have no clue how I did it the first time, other than complete supernatural strength. I was there for a month. Never left once. Never showered. Barely ate. Barely left the room. My friends tell me now I was border line delirious half the time. But I’d just had a baby, I was watching her die before my eyes and I was a SINGLE MOM. All of those factors combined made for such a difficult experience. This time, I wasn’t alone. My family and my husband made me leave the hospital to eat-every single day-every single meal. They made me take breathers. Showers. They even made me have a night away in my own bed. At first I felt guilty, but I quickly realized, I needed that self-care in order to be there for my girl. I didn’t listen the first event, and it took years of recovery for what it did to my body. This time I listened. I took care of myself. And it was the right call. Didn’t mean it wasn’t still exhausting and hard. It was still all the things. But this time, I find myself bouncing back much quicker. Thankful for those who looked after me (especially my husband) so I could look after her. Mama’s in this same situation, never feel guilty for doing the same. 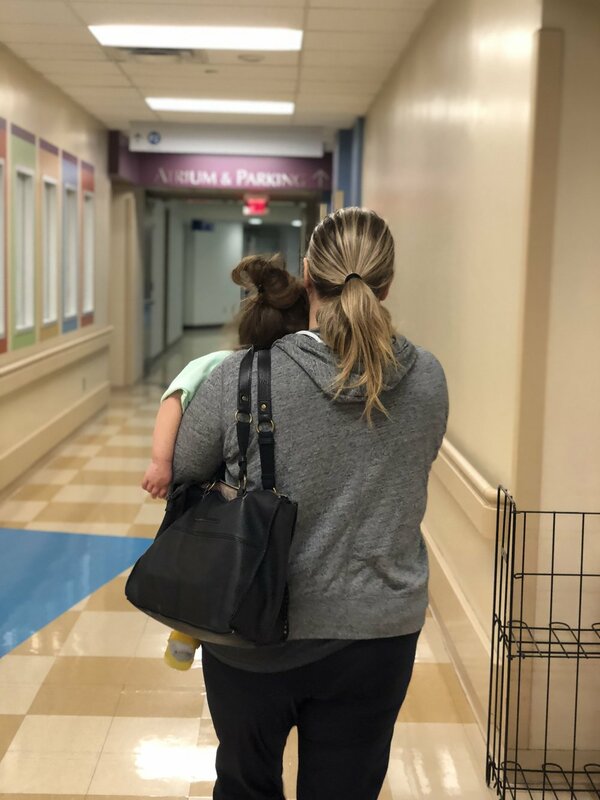 The day we got to leave the hospital, I was so grateful to be walking out those doors, with my daughter in my arms, for the second time. I’m keenly aware not every parent has that same result. And we have with Ellis. More than once. I don’t pretend to know the reasons why. It doesn’t seem fair. Yet I’ve been on both sides of the coin. I’ve been the one leaving without a loved one and walking into a new reality. All these years later I still don’t understand all of the “why’s” behind it all. I’ve also resigned myself to probably not ever knowing. One thing I do know, is there is purpose and there is meaning-that is so much bigger than us. That’s what I’m going to keep holding onto. It’s bigger than us. I don’t get it. It’s hard. It’s good. It’s hard. It’s just...bigger than us. I’m grateful for each day with my girl and forever thankful for the ways her life has made me better, and continues too. She teaches me so much. With each breath she takes....as those mountains keep falling at her feet. *Love reading this blog? Lets be friends officially! I can come right to your email Inbox. All you have to do is hit the Subscribe button. Thanks for following along on our journey, new friend!